It’s a thing. Like a bad garbage dump, you can smell it 3 towns over on a hot day and the wind blows right. The kind of repugnance that curls your nose hairs, tears the eyes and recoils the mind. A smell so foul, you can’t escape it – and it’s clung to the team for almost 10 years. 10 YEARS! 10 years out of the playoffs, 10 years of bad signings, 10 years of poor drafting, 10 years of former dynasty players running the team (into the ground), 10 years of bad injuries, 10 years of underperforming, 10 years of bottom basement finishes, 10 years of high draft picks. 10 years of stink. But today, something seems different. Something’s happening. The stench appears to be retreating, the gaseous cloud thinning. NO, it’s definitely not gone, but it’s somehow not the same as it used to be. 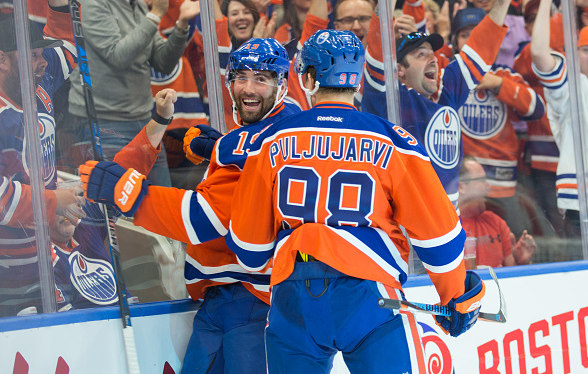 This morning, the Edmonton Oilers sit atop the Western Conference in 1ST place through 7 games at 6-1-0. Their best start since the mid-80’s (the era they were really, really good, remember? Remember??). A start so good in contrast to the previous years, us fans don’t know what to do with ourselves. Especially when you hold it up against the last 5, where in all of those seasons, the Oilers couldn’t amass 6 wins without playing AT LEAST 15-20 games. By which time playoffs were already a distant bell – the team planning spring golf tours in mid-November while fans prepped for draft parties before Christmas. It’s been hopeless for a long time. But maybe, just maybe, this team is on the verge of putting this wretched past in the rear view mirror. On opening night this season, only 7 players were in Oilers silks as were there 1 year ago. When GM Peter Chiarelli and head coach Todd McLellan were brought in for the start of last year, many felt that this was the ending of that terrible aforementioned era. Gone were the inexperienced, former players at the helm and in came the tried, tested and true duo from outside the organization. They were, without a doubt, the men who would right the ship and get the team back on track. However, when the team finished second from the bottom in yet another atrocious season, many in the blogosphere were quick to point the finger at the new generals. I disagree. I look at it like this: if you invest in an old, dilapidated house with the hopes of renovating it into a place you can be proud of, there is much work to be done. You don’t just slap a coat of paint on the walls, lay some fresh carpet, pile in some new furniture and call it a home. No, sometimes (especially if it’s in a really sad state) you’ve got to really inspect that sucker. Take it down to the studs, cut out the mold, remove the faulty wiring, kick down some walls. Then you can begin to build anew. That takes time. And that was year 1 for Chiarelli/McLellan. They have now seen what works, what needs to be replaced and where to put the new sunroom. Taylor Hall for Adam Larsson Trade – There has been no bigger criticism against and no larger hole to fill than that of the Edmonton Oilers’ defence. A carousel of cast-offs, has beens, never were’s and “who let you near a pair of skates” the likes of which you have never seen. A virtual front-line of soldiers marched into battle only to be used as a human shield to allow the others time to escape. It is for this reason this trade had to be made. This team would be forever doomed to repeat its mistakes of the past if they didn’t go out and get themselves a top-pairing, right handed/right shot defenceman. They found that in Adam Larsson. Watching him play for the Oil Drop in the early goings of the season has been a breath of fresh air. Calm with the puck, good to above-average decision making, physical in the corners, great outlet pass; something Oiler fans haven’t seen since the days of Chris Pronger (no I don’t think Larsson is Pronger, calm down) and it’s been wonderful to watch. Did the Oilers lose this trade? Yes. Was it necessary? Yes. Was there a better option? There was (PK Subban) until Columbus decided to take Pierre-Luc Dubois third over all at the draft and any deal fell through – so no. Was Taylor Hall a massive over-pay? Yes and when you’re as desperate as the Oilers were for this type of player, the 29 other GM’s in the league can smell blood and they were going to make them pay regardless. When something is in that high demand, the price can only go up. Have you seen the cost of epi-pens? The Bruinization of the Oilers – Despite icing highly talented (or maybe just highly touted), skilled, young forwards that the Oilers drafted year after year, the team was often pushed around and bullied by other much larger teams in the very physical Western Conference. So when Peter Chiarelli was hired, he was clear quite clear that part of his mission was to make the Oilers bigger, harder to play against and stronger on the puck; much like his former team, the Boston Bruins. Nothing was more evident of this than the signing of the Bruin, Milan Lucic, hired to ride shotgun with non other than Connor McDavid. Add to that trades for Patrick Maroon, Zack Kassian, Eric Gryba and Adam Larsson, plus the promotion of Tyler Pitlick and Anton Slepyshev from the AHL, and all of a sudden the Edmonton Oilers have been a much heavier, nasty, truculent team to play against so far this year. The Signing of Kris Russell – A last minute signing that drew the ire of every advance stat blogger with a keyboard. He’s led the league in blocked shots for the last few seasons, but the experts will tell it’s because he sees more shots than a blood clinic. To top it off, the general fandom was also upset because they were waiting for a bigger named addition. There were articles upon articles promising a second defenceman that would put the team over the edge. We were told about the possibility of Travis Hamonic, then Tyson Barrie, followed by Cam Fowler or even Hampus Lindholm. Kris Russell is a far cry from any of those players, but what the Oilers did get was a functional, NHL bonafide, experienced mid-pairing D-man who can wheel, make/take a pass, kill penalties and all he cost was money on a one year deal. Plus his addition has allowed the younger, less capable blue liners get pushed down the depth chart which is paying dividends in and of itself. Far too often the Oilers have been leaning on players playing well over their heads, batting too far up the order. Although Cam Talbot was brought to the Oilers in the 2015/2016 season, after a rough start, it took him about a third of a season to get his feet under him and play up to his potential. I would imagine that coming from the predictable, rock-steady D that was the New York Rangers to the perpetual bee-hive chaos that was the Oilers would be akin to that scene in Bambi where the poor fawn first steps onto the ice with Thumper. But by the time Talbot was able to make sense of the Three Stooges skit playing out in front of him, the season was lost. However this year, despite a wonky game in Buffalo (it was early and goaltending has not been good to start league wide) Talbot has taken very little time to round into form this far. Although the play of the team on a whole has been much improved, when they have had their lapses, Talbot has been there to shut the door- re: his save on Jeff Skinner point blank with seconds left in the third in game 4. He currently has a 2.49 GAA and more importantly, .927 save % . Compare that with the number of former net minder’s Dubnyk, Khabibulin, LaBarbera, Bryzgalov, Deslauriers or Scrivens and he’s the second coming of Dominik Hasek. Yes, he gets his own section, he’s that damn good. He has, at times, literally put this team on his back and turned games around – re: after the 2-2 tie in Calgary or the go ahead goal in Winnipeg, or the 3-1 goal against Washington after Ovechkin scored. The relative Corsi for this player is off the charts (His personal CF% is 56.4. His relCF% is 15.9). As of this writing, Connor is in the league lead with 11 pts in 7 games and is pure poetry in motion on the ice. In the past, as a fan when you watch the Oilers, there is a tension to it. A tightening of the muscles as though if you were to relax them, the roof of the building would come crashing down upon you. Any and all atrocities were possible. Watching Connor McDavid is the first time I can remember since Paul Coffey pulled up to my St. Albert elementary school in his whale-tail Porsche (you could’ve taken a bath in that spoiler) where I feel confident of what’s happening in the game before me. Speed. Intelligence. Determination. Imagination. He’s absolutely electrifying. A pure joy. One of the best players I’ve ever seen play the game – and I was in Edmonton to watch Gretz and the boys play live for 6 years. I’m not kidding. If the Oilers of the last 10 years are the unthinkable stench, Connor is the aroma of your local bakery at 8 in the morning. He is a CN Tower of Right Guard, a great lake of Febreeze, all wrapped in 3000 miles of Downy sheets. I could go on until there are no adjectives left in the dictionary. Honestly. Add to all of these points a returning coach with a familiar system, the further development of young players Leon Draisaitl and Darnell Nurse, AHL players Tyler Pitlick and Anton Slepyshev taking the next step and another tremendous top 3 pick in Jesse Puljujarvi and you’ve got yourself a possible team of odour-eaters. But will it last? Despite all of the good arrows for this team, let’s not get ahead of ourselves. 7 games is an extremely small sample size (20 games seems to be the reasonable waiting period) and there are still glaring swiss cheese-like holes in this hockey club that could have the wheels falling off the bus in no time. Plus, as Oiler fans, we’ve learned (painfully) to be suspect of everything surrounding the Copper and Blue. It’s possible this team may just be showering in cologne, if you know what I mean. Didn’t I just claim this previously to be a strength? It has, but there is danger here for this team. After Cam Talbot, the goaltending depth is incredibly thin. Backing up for this team is Jonas “the Monster” Gustavsson – one of Chiarelli’s more curious signings. The only thing monster about him is the amount of goals he’s allowed. A GAA of 2.87 and .902 save% throughout his career. Couple that with the fact that the next best option is down in Bakersfield of the AHL: Laurent Brossoit, a goalie who’s played all of 3 NHL games. This team better pray to Jim that Talbot stays healthy and can handle playing 70+ games. Currently the Oilers are 4 for 22 on the power play which puts them at 18.18%. League average is 20.03% which may make you think that it’s not that terrible, however what the numbers don’t tell you that your eyeballs do is that the Oilers have a terrible time with zone entries and that many of those gaffs at the blue line have led to far too many shorthanded opportunities for opposing penalty killing units. They’ve already allowed two shorties this year so, using your calculator, you can see that they’ve given up half as many goals as they’ve managed to score. Despite all of the talent up front on this team, the power play has been a significant weakness for years and has cost the team numerous games by not being able to score when gifted grand opportunities. What’s missing? An offensive minded, right-side, right-shot defence man who can quarter-back the power play and gain entry to the offensive zone. Now if only the team had another Taylor Hall to give up, the Oilers could find themselves one. Jordan Eberle. It starts off pretty good, but then it drops all the way down to a bunch of players trying to punch outside of their weight class. Like Zack Kassian (who’s like a box of chocolates) and currently playing on the second line or Tyler Pitlick and Anton Slepyshev who are role players at best. The team did try to address this need in the off season by inviting Kris Versteeg to camp on a PTO but, in a move that could only happen to the Oilers, Versteeg opted not to take Edmonton’s contract offer and then took his services 3 hours down the road to the Calgary Flames. There’s also shiny new toy Jesse Puljujarvi, but he’s all of 18 year’s old and for once, I’d like to see the Oilers treat their top prospects accordingly and bring him along slowly. Rushing prospects into the league is something I’ve seen far too often with poor results. I’m looking at you, Nail Yakupov. I guess I could have also categorized this as depth or lack there of, but the Edmonton Oilers are one torn ACL, one concussion, one broken collar bone away from disaster. And at this point, it’s the shoe all of us long time fans are waiting to drop. It’s really been a large part of the story forever. This team has endured a plethora of injuries over the past 5 seasons with 368 man games lost last year alone. That equates to 4 and half players lost for an entire season. Plus, more often than not, these injuries have happened to significant roster members. Jordan Eberle missed the start of the season last year with a bad shoulder, Ryan Nugent-Hopkins broke his hand in March, and Oscar Klefbom lost 50 games because of a Staph infection. Not to mention Connor McDavid losing out on half the year (and the Calder trophy) from crashing into the boards against the Flyers in a three car pile up. A major injury to Eberle, as mentioned above, would leave a glaring hole at right wing. If Adam Larsson went on the IR, there’s only one other righty on the blue – Eric Gryba. If Cam Talbot pulls a groin carrying his new baby twins, there’s not a goalie within 1000 miles who can come and stop the puck. Or if they lost McDavid??? Shut your mouth. Although I’m certainly enjoying this year’s hot start, it will take time for me to accept it. Also, you won’t find many Oiler fans shouting from rooftops. Or antagonizing our Flames brethren in Calgary. Or planning parade routes on White Ave. No, we Oil drop supporters are slow to trust. Too much has happened to us to too quickly embrace our new surroundings. It’s a strange place to find ourselves in and there are more reasons than Bettman boo’s not to trust it. The foul stink of losing permeates and settles into the skin that we carry with us like a cigarette smoker coming into the office after a puff on a cold, prairie winter day. But should this winning trend continue, should this be a true turning of the tide, a turn North, we will learn to relax, sleep better at night and perhaps smile once more. In the meantime, you may want to keep the clothespins close at hand.